There are some 20 clubs and groups in the parish, providing exercise, entertainment and stimulation for the young and old alike. Take a browse through the list below to see what's on offer. ​Click anywhere in the green bar to expand each activity. If your club or group is not listed, or you need to change details, please Contact us so that we can help. A tutored group meets each Tuesday from 11.00am until 1.00pm in the Yeo Room in a relaxed and friendly atmosphere to enjoy working to develop their individual skills and techniques in various media. We may discuss a particular theme each week from visual material that may include the way artists use a particular medium, how we observe and communicate what we see, or a particular technique. Each person either develops their individual interests or the theme may trigger a way of working to hone their individual skills and techniques, drawing or using their preferred media of pastels, watercolours, acrylics etc . We try to keep abreast of topical exhibitions and new media on the market that might add to or open new ways of seeing and working. All levels of ability are catered for. All ages and abilities are welcome to our friendly environment. Equipment is provided. Contact - Jo Smith (Club Secretary) on 01548-560347 or 07785356611 or at jo@cottonspringfarm.co.uk for more information. The club is committed to patrolling the beach every weekend throughout the summer, whilst developing life saving skills through the education and training of its members from the age of 7 upwards. 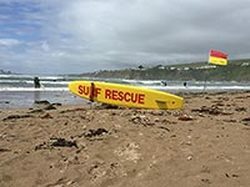 BSLSC has been saving lives on Bantham Beach since 1960, and continues to assist and rescue dozens of beach goers each season. The club has a vibrant social scene, and competes in local and national competitions. The club is very grateful to the local community for their continued support which enables it to excel. Contact - Neill Irwin on 01548-561661 or at neill.irwin@btinternet.com for more information. POTS came into being when the Pump House on Main Street, Thurlestone, needed rescuing, and the Parish Council wanted it done, but had no funds. POTS raised the funds, and carried out the necessary work. As it says in our Constitution, the Objective of POTS is "to conserve, care for, and improve whenever and wherever practicable, features of cultural, historic or natural interest and those things which add to the amenities of Thurlestone, Buckland and Bantham. This work to include a watching brief on planning applications and the carrying out of practical works to improve this area. It will inform and educate to stimulate interest in, and concern for, the area". As can be seen, the constitution is written loosely enough so that it can cover just about anything! POTS is not a registered charity, but if it needs charitable status at any time, it uses the South Hams Council for Voluntary Services number, for which we pay an annual subscription to be a member. Other memorable POTS achievements include the local walk maps and the major opus "Land of the Five Beaches", which won a Royal Television Society award, and still sells well in the Village Shop today. Contact - Chris White on 01548-560505 or at chrisandlisa@themead.co.uk for more information. The Save Bantham Website provides key information about Nicholas Johnson's change of plans from no change to significant development, which will affect residents and visitors alike. You will get to know about the Save Bantham resources, including information and updates. The Save Bantham Facebook page gives an opportunity for open discussion about issues with changes to the privately owned estate that may directly impact Bantham, or have a knock on effect for surrounding communities. E.g increased parking charges, or closing the whole car park out of hours may cause more traffic for those accessing the coast at Thurlestone and South Milton. We are a small, friendly group who do all sorts of needlework, patchwork, embroidery, tapestry, knitting and even mending. Come along for a coffee, meet the group and see for yourself what we do. The South Devon Kitesurf Club was set up about 10 years ago by a group of like-minded individuals to represent the sport they love and to promote safety and responsible kiting at Bantham, Bigbury, Thurlestone and other local beaches. The club is a non-profit organisation and is affiliated to the national governing body, British Kitesports. The club provides a central network and a forum which covers all kite related issues as well as being a focal point for social events and organising trips to the beach. The Club has 3 official committee members, and several hard working helpers. For more information please see our website at www.sdkc.co.uk. The Friends of Thurlestone Church is a group of like minded people who value this fine Parish Church, parts of which date from the 13th Century. Their aim is to support, and raise funds for, the Thurlestone Parish Church Building Trust, a charity formed in 1995 for the preservation, repair and maintenance of the fabric of the Church building, its monuments and surroundings as a place of historic and architectural importance. An endowment fund has been built up of which, at the discretion of the Trustees, the capital and interest may be used to assist the Parochial Church Council to carry out works on the building and churchyard within the objectives of the Trust. To date these have included: re-lighting of the interior, re-slating and insulation of the roof, overhaul of the bells and belfry, re-pointing of the tower and, most recently, replacement of the organ. The Friends are non-denominational and welcome support from all those who admire and love this ancient building be they parishioners or visitors. Contact - Phil Millard on 01548-560843 or at millardpj@hotmail.com for more information. We have been meeting for three years now, at 8 Mead Drive, the home of Alastair and Gill Durden, on alternate Thursdays. We sing for an hour, from 5 pm to 6 pm, which is a very useful time because it does not intrude on the evening time! We are a very relaxed and informal group, which suits the venue - our living room! - and now total around 16. Anyone who enjoys singing can come along (it's free!) and men are particularly welcome. We sing a variety of songs, ranging from Show songs and Folk songs to Spirituals and a lovely version of The Lord's Prayer. We have also sung Cat Stevens' version of Morning Has Broken. So do come along - you will be very welcome. For details of dates that we meet, ring Alastair on 01548-560509. Contact - Alastair Durden on 01548-560509 for more information. Contact - Mike Stickland on 01548-560763 or email stix@talktalk.net for more information. All content on the Clubs & Groups pages provided by the named Contact, who is solely responsible for its accuracy.